Possum Magic 2013 The Final Farewell Tour! Grandma Poss made bush magic. She made Wombats blue and Kookaburra's pink, Dingo's smile and Emu's shrink, but the best magic of all was the "Possum Magic", that made Baby Hush invisible. Grandma Poss made bush magic. She made Wombats blue and Kookaburra's pink, Dingo's smile and Emu's Shrink, but the best magic of all was the " POSSUM MAGIC ", that made Baby Hush invisible. First published in 1983 Possum Magic was an instant success with children and parents alike. In 1990 the musical stage adaptation had its world premiere, which was SOLD OUT before it opened. Since then Possum Magic - The Musical is now firmly established as the most successful musical for children and families EVER. There have been 3 extensive national tours, funded by Playing Australia and countless shorter seasons across the nation. 2013 will mark the 30th Anniversary of publication and over 20 years on stage. It's not very often that we score both the author AND the illustrator of one of our favorite new picture books for one event. Heck, it's not very often that anyone lands an event like this. (Especially when one of them has to travel half the globe to get here!) So we feel pretty lucky, and you should, too, because you're invited. Mem Fox's sweet, lyrical words and Lauren Stringer's expressive, beautiful artwork are the perfect combination in Tell Me About Your Day Today. Come hear the story, see the artwork, meet the talented and lovely author and illustrator...and who knows? Maybe we'll all tell each other a little something about our days. Monkey in the Middle Storytime! Monkeys are pretty similar to people in a lot of ways. Like us, monkeys love bananas, have a penchant for mischief, and are also pretty darn resourceful. And that's why they are so much fun! Today we are reading all kinds of stories about monkeys and their entertaining escapades, including the brand-new Two little monkeys by Mem Fox. So eat a banana and get ready for some mischief. This morning at 10:30 AM. Mem Fox , Where Is the Green Sheep?. 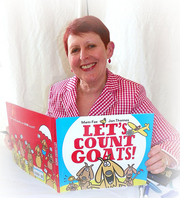 Mem Fox is currently considered a "single author." If one or more works are by a distinct, homonymous authors, go ahead and split the author. Mem Fox is composed of 13 names. You can examine and separate out names.